Scroll on down for video and enjoy! For the second successive year a team from the Guy Harvey Research Institute (GHRI) has visited Isla Mujeres, off Cancun, Mexico to deploy SPOT tags on mako sharks caught in the recreational fishery. Last March we tagged three makos with only PAT tags. We were hosted again by Capt. Anthony Mendillo on board the Keen M. By the time of the full moon in March the makos are showing up. Typically the sailfish season is coming to the end of the first “winter run” so Anthony has been targeting makos at this time of year with some success. The 2013 winter sailfish season had been spotty and the weather had been rough. Nothing changed for our mako catching project. Accompanied by Dr. Brad Wetherbee, angler and Miami’s NBC6’s weather anchor Jennifer Reeves and producer/cameraman George Schellenger, we braved strong SE winds of 25 – 28 knots and arrived at the “mako zone” out in 200-300 feet on the continental roll off into deep water. Here the Gulf Stream kicks in and the current moves to the north at 4 knots. Jennifer was making a pilot for her upcoming fishing TV series called “Beyond the Reef” and the timing was good for her to be the angler on this expedition. Anthony and crew three trusty mates Ruben, Gallo and Tito put out a spread of three swimming dead bonito baits on cable leaders. Dolphin are also a good bait if available. The plan was for Jennifer to do the angling and depending on the size of the shark, sea conditions, etc., we would board the mako to have better control on the fish for Brad to deploy the tag on the dorsal fin. We got the mako bites and Jennifer went one for three and I farmed one that was part of a double header. Ouch! We could have put out four tags had we had better luck. But we were successful in getting one female of 125 pounds on board, irrigated, measured, tagged and put back in the water. This is no easy task hoisting a fish as powerful as a mako on board, so the technique was a work in progress: shark tail roped, carefully lifted into the boat, cover the face with a towel put the deck hose in its mouth and the crew hold down the shark so Brad can attach the tag to the dorsal fin. It all worked well and each shark was in and out in six minutes. We named the first mako Jen. We had no bites on the second day. We did catch some dolphin and fresh bonitos and raised a couple of sailfish. Then a fine 400 pound blue marlin came through the spread that could have eaten the trolled bonitos or dolphin but just gave us all big excitement for a couple of minutes…oh for a live bonito! It was another very rough day, but a cold front was approaching. Unfortunately the lull in the wind before the front arrived at night. Jennifer headed out having experienced some reasonable fishing and accomplished what she set out to do. Day 3 started out at 15 knots of north wind and then increased to 20 knots. However, Anthony found a 100-pound female mako that I caught and the team performed the SPOT tag deployment safely as the seas were building from a different direction. I swam with Lilly as she went away strongly near the surface leaving me in her wake. So we were now two for four and I was feeling better. On the way in we caught some bonitos for bait and I went for a swim with a baitball where the sailfish had finally decided to show up. Day 4 was a screamer. Any sensible captain would have said no go, but Anthony was working with Harvey Berets. We went south and started fishing on the roll off adjacent to Cancun. The current was ripping north and the wind howling 25-30 knots northeasterly so the seas were piled up short and breaking over the bow and stern. A side slapper had the crew on their knees and the cockpit full of water at one point. We had the baits working well but did not get a bite. Time to head to the dock and Ballyhoo’s Bar! On our last day, we switched fishing to the Chachalaca a 48-foot Cabo owned by Lawrence Berry of Texas. Lawrence has been a keen supporter of the fish tagging projects in Isla Mujeres and often makes his boat available for the work we conduct. The wind had calmed down to workable 20 knots, as the cold NE wind persisted. We did not get a bite until 2:45 p.m. and I reeled in a 150-pound male. This mako was in and out in a few minutes and I swam with him on release, getting footage showing the swimming shark we called Sonny with SPOT tag in place as deep as 80 feet. We had received updates from Jen (the mako) who had moved into the southern Gulf of Mexico. She is double tagged with a PAT as well. We have heard only once from Lilly and Sonny so fingers are crossed for good recovery and tracking from all three mako sharks. These are the first three makos tagged in the Atlantic Ocean. The GHRI has sponsored SPOTs on four makos tagged in New Zealand that are providing great new data. Dr. Molly Lutcavage returns Isla Mujeres in April to deploy 12 more PAT tags on sailfish in the continued sailfish migration study the GHRI/University of Massachusetts is sponsoring with assistance from Anthony Mendillo and his amazing crew. From the January 2012 effort, we heard from 10 of 12 sails tagged, several went the 6 month term and the data will soon be made available. 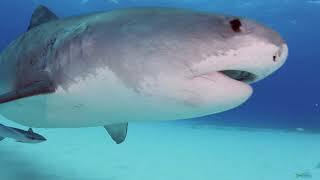 Guy Harvey Leads Isla Mujeres Expedition – Mako Sharks from George Schellenger on Vimeo.